This Pointe shoe is from the Russian Pointe Jewels collection. The brilliance of Sapfir (“sapphire”) will never grow dim! From the Jewels Collection, Sapfir v-cut pointe shoes flatter the slender foot with a brilliant fit and the clean lines of a pleatless platform, low crown and sleek heel, and pliable, long-lasting shanks. The medium platform size and tapered box are ideal for tapered toes and narrow feet. 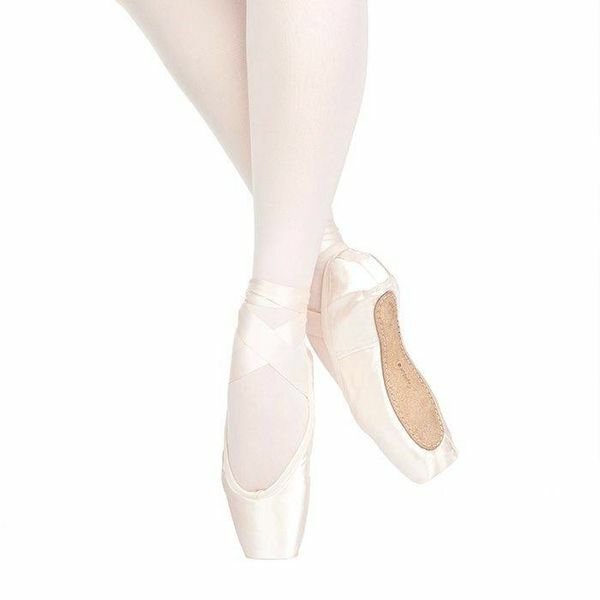 Russian Pointe’s revolutionary pre-arched construction mimics the shape of the foot on pointe, to highlight the arch while facilitating pointework and minimizing break-in.